Many would say Van Dijk. The rest would say Salah. There is no way that Wijnaldum has been "comfortably" their best player. He wasn’t even on the bench tonight. Guess he has picked up a knock. 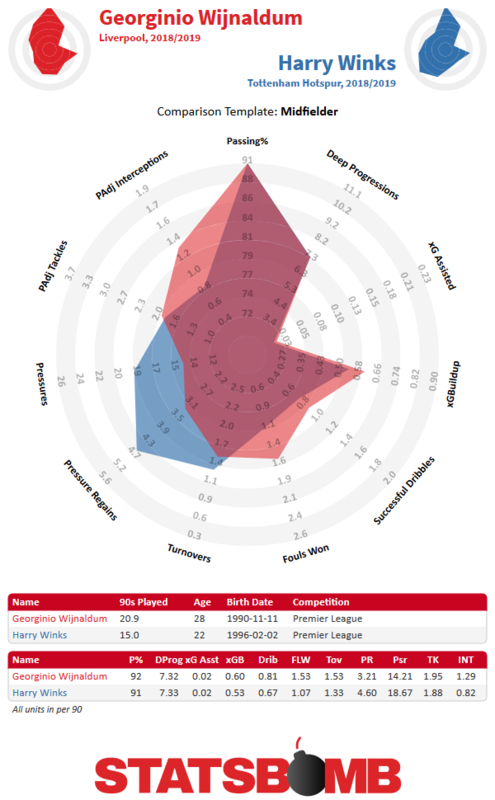 I'd say that shows Winks has been a good bit better. Henderson's like Dier in the way that Rasiak is like Kane. Robbo, 90291Spur, galeforce and 1 other person like this. Speak to anyone using received wisdom and they'll tell you the same thing as everyone else relying on received wisdom. p.s. was going to comment that Winks game has picked up in last couple of games, my opinion he has been far off his best this season in general, but some signs of it returning. I think he played a very cautious game when he came back from his injury and seemed less keen to take risks. Poch said as much. But as he has played more he has grown in confidence and we are now seeing more of the pre-injury Winks, with improvements. Plus from comments after the Fulham game it sounds as though he is really being encouraged in training to get more involved in attacking play. I am looking forward to watching him progress. Personally Id say Firmino, who I think is excellent and most underated. For me their attack falls apart without him. I certainly don't receive wisdom from anybody who thinks they could've successfully sued Heung Min Son for completing his National Service for South Korea. That sounds a lot like a reading fail on your part. I suggested that the threat of a court case might be enough to make him decide he didn't want to go and play soldiers. Most cases are settled before they get anywhere near a courtroom and I would have expected this to be the same. Mosquito_Coasting, milo, Huddy and 5 others like this. I said it before - as I’m that old - he reminds me of Stevie P. Hustle and bustle and sharp dribbly bursts forward. LOVE him. Minus Stevie's magnificent sliding tackle, now outlawed of course. One of the best performances he's had imo. Did everything really well apart from the cross field passing, he can spend the summer working on that. Put in a great defensive shift and is our go to man when we transition from defence to attack. Robbo, nayimfromthehalfwayline, harr1984 and 1 other person like this. It’s his ability to make space for himself under pressure that continues to make him stand out to me. Coupled with his good forward passes, driving runs, work rate and stamina, and improving defensive position and awareness, I continue to think he could be a title winning caliber starting midfielder eventually.